The ocean food web is built on the productivity of tiny photosynthetic organisms called phytoplankton. Roughly 50% of global carbon fixation - the transformation of inorganic carbon, such as CO2, into organic carbon, such as sugars - occurs in the ocean. The rate of phytoplankton productivity in the ocean in turn depends on the amount of nutrients (i.e. “fertilizer”) and the amount of solar energy available. Since nutrients are used up in the sunlit waters of the surface ocean as phytoplankton grow, the resupply of nutrients depends on physical oceanographic processes that carry or mix nutrient-rich waters upwards. The MOD science team uses our observational expertise to gather concurrent measurements of physical, biological, and chemical parameters. We gather these observations with high spatial and temporal resolution - often using our Wirewalkers - which allows insight into the tight coupling between physical and biogeochemical processes. For example, we study the role internal waves play in coastal ecosystem productivity, the detailed evolution of upwelling systems subject to unsteady winds, the relationship of submesoscale circulation on primary productivity, and the short-time scale evolution of the deep chlorophyll maximum in the oligotrophic ocean. 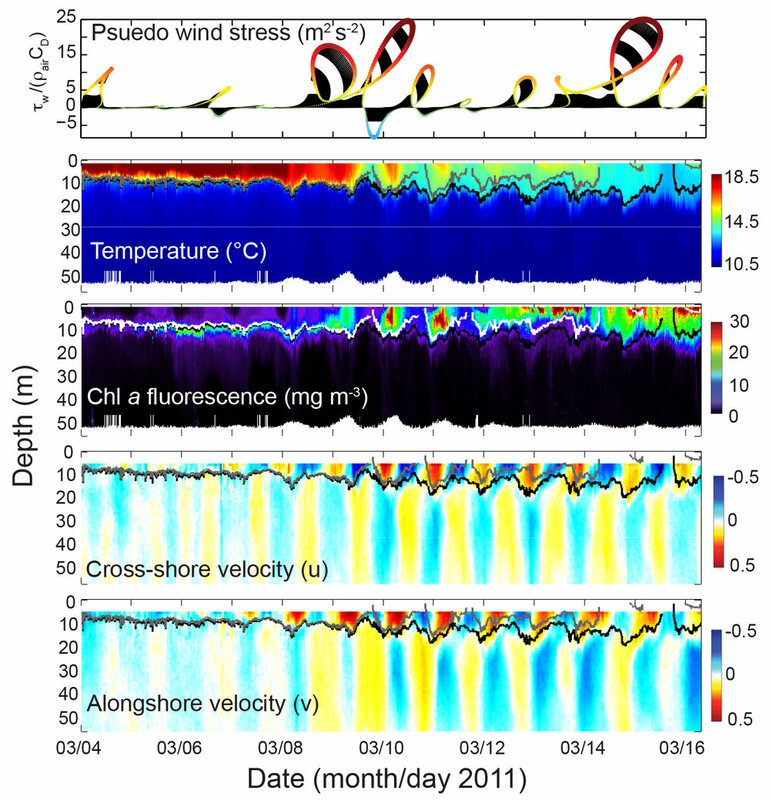 The data shown are gathered from a Wirewalker profiler (temperature and chlorophyll) and an upward-looking ADCP (cross- and alongshore velocity). These data were collected off the west coast of South Africa, one of the most productive ocean ecosystems in the world. The vast majority of the tropical and subtropical ocean has very little phytoplankton in the surface waters. Yet, due to their vast size, they play an important role in global biogeochemical cycling. This two week time series of a Wirewalker drifting around a mesoscale eddy in the Bay of Bengal shows the exquisite finescale layering in the deep chlorophyll maximum (DCM) and the daily and semi-diurnal changes in DCM depth and concentration. These features are completely invisible to satellite remote sensing.